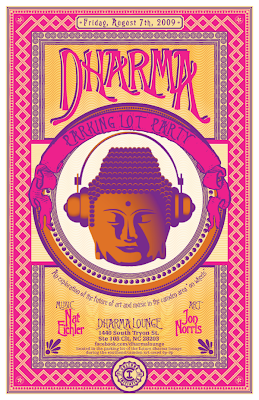 Dharma Lounge is "an eclectic and enchanting fusion of art, entertainment, music and musing"--as described on its website--that was scheduled to open last October in South End. After that opening didn't occur, I haven't heard much about the lounge that is planned to occupy 3,000 square feet. But I received an email this morning about a Parking Lot Party being held tonight from 6 to 9 p.m. at the Dharma site (1440 S. Tryon St.). There'll be live music, art on display, and you'll be able to learn more about this soon-to-be-added attraction to Charlotte's nightlife scene as well as receive a complimentary membership. This event is in conjunction with the South End Gallery Crawl. Dharma Lounge is now scheduled for a late summer 2009 opening, which by definition should only be weeks away. You can learn more by visiting www.dharmacharlotte.com or www.facebook.com/dharmalounge.